South Africa at the southern tip of the African continent is like a huge wild garden full of natural beauty just waiting to be discovered. The KeaRider Wild Garden Motorcycle Tour through South Africa takes you to the most beautiful places of the country. Discover the city of Cape Town, the elegant wine-growing areas of Stellenbosch and the rugged and panoramic coastal roads that you bring to the Cape of Good Hope and Cape Agulhas, the southernmost point of Africa. Of course, visits to game reserves are also part of your road trip through South Africa, so that you are able to see lions, elephants and giraffes in the wild. Picturesque villages such as Swellendam and a motorcycle ride on the famous Route 62 round off this road trip in South Africa. After an individual journey, tour participants meet in Cape Town and then take a relaxing tour to the Cape Peninsula, where you will visit the Cape of Good Hope, and the oldest winery in South Africa. On the beautiful coastal road Chapman's Peak Drive you will cruise back to Cape Town. Today you will drive along the coast to Cape Agulhas, the southernmost point of the African continent and then spend the night in Arniston. A little history is now on the agenda a visit to the historical town of Swellendam and the Bartolomeu Dias Ship Museum in Mossel Bay. On the Garden Route you will continue to drive on to Knysa. The Knysa Elephant Park is a highlight for all animal and nature lovers. End this beautiful day with an overnight stay in a typical South African lodge. Via loop from the Garden Route, you will head to Tsitsikamma National Park. Accommodation is in Port Elizabeth. You will receive another opportunity to get to know the unique animal life on this day in the Addo Elephant National Park, where not only elephants can be found but also lions, giraffes, zebras and rhinos. 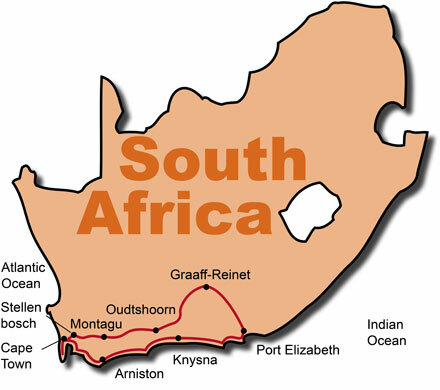 Accommodation is in Graaff-Reinet. Today a long motorcycle tour is on the agenda: you will visit the Valley of Desolation and cruise the Great Karoo to Oudtshoorn. On an ostrich farm in Oudtshoorn you will have the opportunity to ride an ostrich before you visit the Cango Caves. The rest of the day is free to your disposal. You will leave Oudtshoorn and cruise along the Route 62 through the South African wilderness via the Tradouws pass to Montagu. A day for connoisseurs is our tour to the old French town of Franschhoek and the picturesque wineries in Stellenbosch, where you will also spend the night. The last stage of the motorcycle tour takes you back to Cape Town, where you will start your individual journey back home.